Last year I bent to the will of the tabloid abomination The Daily Mail (land of bigotries of diverse kinds, terrible reporting and a bizarre attitude to cancer), for they were stuffing their pages with Lego. I feel shame, but the allure of cheap Lego is just too great. I do actually return the newspaper once I’ve been given the Lego though – that usually gets a very confused look from the staff at the till. I guess I’m paying with my soul. 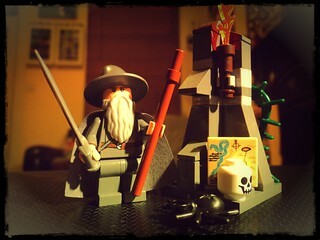 One of the many sets we acquired is this awesome Gandalf The Grey at Dol Guldur. I’m very fond of it, especially of the giveaway polybags because it’s got a whole mini diorama goin’ on – it’s not just a car (it’s not a car at all… this is a terrible example). There are a decent number of bricks and of a very useful kind. I’m obsessed with slopes. I have no idea why, but I crave them, especially the 1×1 cheese slopes. 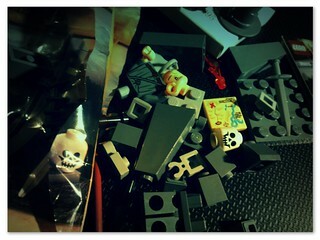 I went nuts in the Lego Shop in Sheffield and got handfuls of the olive green ones recently *ecstatic shudder*. But my god the extras! 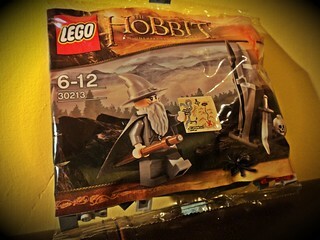 Tendril/creeper, flame, minifig skull head, weapons: spear and staff (you cannot have too many weapons), a spider (horrid thing) and, perhaps most important of all, that gorgeous 2×2 tile with the printed map of Middle Earth. 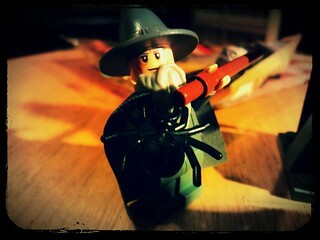 Oh, and Gandalf of course! He’s got a beard, cape and a cool hat. I’m delighted every time I build this little set. Every time? Yes. They also released these in Nottingham with the Evening Post quite recently. I believe we now have about ten of them… They are gradually being fed to me from a hiding placce somewhere within the dark lands upstairs. You see, I need that many map tiles because um… I really really want them. At some point I’ll be able to do a map wall. Or something. I just love this little set.